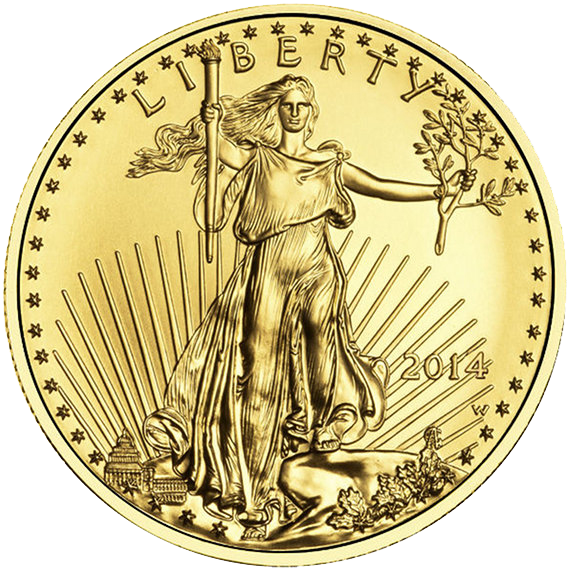 American Gold Eagles – The worlds most popular gold coin! Since the introduction of the American Gold Eagle in 1986 it has become the bullion coin of choice for investors worldwide. 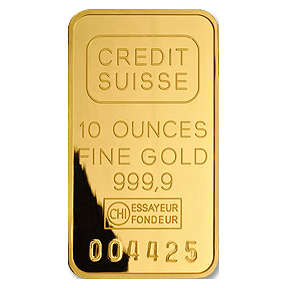 The Gold American Eagle coin is guaranteed by the United States government as to its weight, gold content and purity. 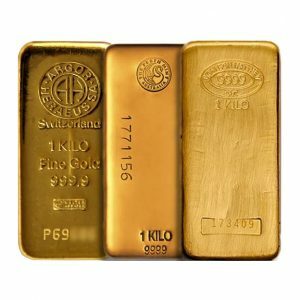 This guarantee offers worldwide liquidity and makes this coin the first choice for gold investors. You can even include American Gold Eagles in your IRA. The obverse design is a rendition of the classic $20 Saint-Gaudens gold coin. The Reverse is a beautiful portrait of a bald eagle returning to her hatchlings. The design is by Miley Busiek. The American Gold Eagle is made of 22-karat gold that has been mined in America. The Gold Eagle 1oz coin is composed of 91.67% gold, 3% silver and 5.33% copper. These alloys make the gold much more scratch resistent than 24 karat gold. 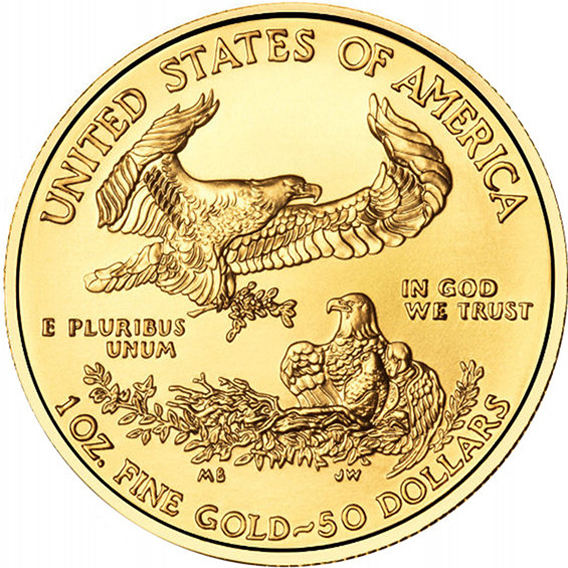 The American Gold Eagle still contains 1 full troy ounce of gold. The coin itself acutally weighs 1.0909 ounces, with the extra weight in silver and copper. These qualities allow the American Gold Eagles to be stored in convenient treasury coin tubes in a very small space. Genuine Legal Tender, Each American Gold Eagle coin bears a $50 face value and the inscriptions 1oz Fine Gold, E Pluribus Unum, and In God We Trust. American Eagle Gold Coins are one of the most beautiful and popular coins minted today. Gold Eagle Coins were authorized by The US Congress in 1985 and first minted by the United States Mint in 1986. 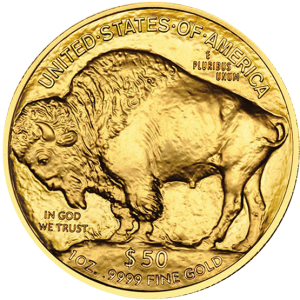 The Bullion Coin Act of 1985 started an American classic. The Gold Eagle Coin is now much sought after by investors and gold coin collectors globally. The Gold Eagle is a22 karat gold coin (.9167 fine) The reason for this is be more durable and resistant to scratching and marring of its gold coin surface. This is a common problem The Canadian Gold Maple has if not handled properly due to its 24 carat make up. The design on the front or (Obverse side) of the 1 oz Gold Eagle Coin is inspired by one of America’s most beautiful circulating gold coins from over 100 years ago, when gold coinage was used as money in the United States The $20 double eagle gold coin (minted in the USA from 1907 until the 1933) was known as a Saint-Gaudens. The reverse side of the modern minted American Gold Bullion Coin depicts a male eagle carrying an olive branch above a nesting female eagle and her hatchlings. The American Gold Eagle Coin’s weight, gold content and 22k gold purity are guaranteed by the government of the United States. Also the 1oz Gold Eagle Coin bears guaranteed inscriptions of troy ounce gold weight, legal tender face value, and the year of mintage. 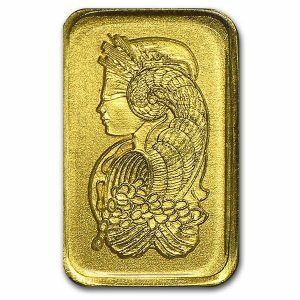 The Gold American Eagle Coin is also IRA eligible and can be to be part of a retirement savings, and can be part of your investment strategy.